Glenn Moor at Troon Village is a gated community with 24 hour attendant on duty. 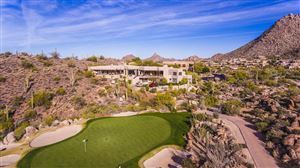 This prestigious community hosts the back nine holes of the private Troon Country Club Golf course. Glenn Moor has a club house with pool, tennis court, and plenty of parking. Glenn Moor custom homes were built from 1986 to 2018, and range in size from 3,000 to 12,732 square feet, on half to multi-acre lots. Some homes enjoin easy walk under Happy Vally Road to the private Troon Country Club clubhouse. Note all homes have the same address: 10801 E Happy Valley Road. See all Glenn Moor at Troon Village.